Thanks for the virtual. 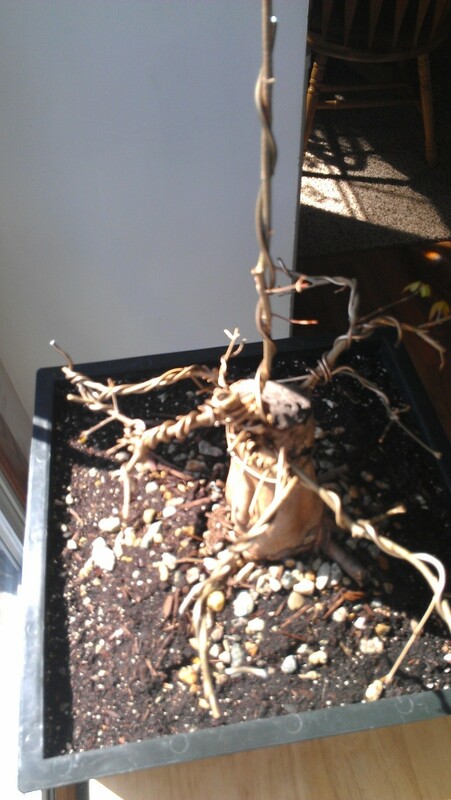 Can I begin pruning and wiring this time of year. Thanks again. I think that you can. Another option is to wire now and then cut back in June/July when the current growth has hardened off. This will allow the branches to continue to thicken and should result in a second round of growth to start to develop the ramification. You may also want to let a sacrifice grow off the top to heal the chop and increase the diameter just above the chop for a smoother transition. I also wonder how it will look from the front right corner to better hide the chop, particularly in light of the virtual. I decided to bring down a few branches but an undecided for which branch to choose for a new leader. 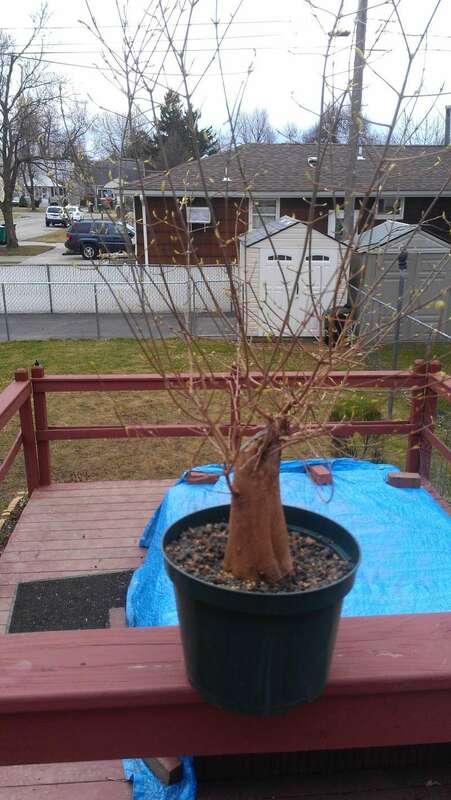 Should I remove and shorten unwanted branches this early in the season? The problem is I have field grown these tridents for several years. Now I dug them up and am scratching my head how to proceed. As a beginner it is difficult to determine if and when I should trunk chop this guy. For the first one posted I would keep the branches coming off the top to fatten the leader. I would also make sure that the wired branches come off the trunk at compatible angles - generally all similar or going from more horizontal at the bottom and somewhat more vertical up higher. it currently looks like the lower branch may be more vertical than the ones above. 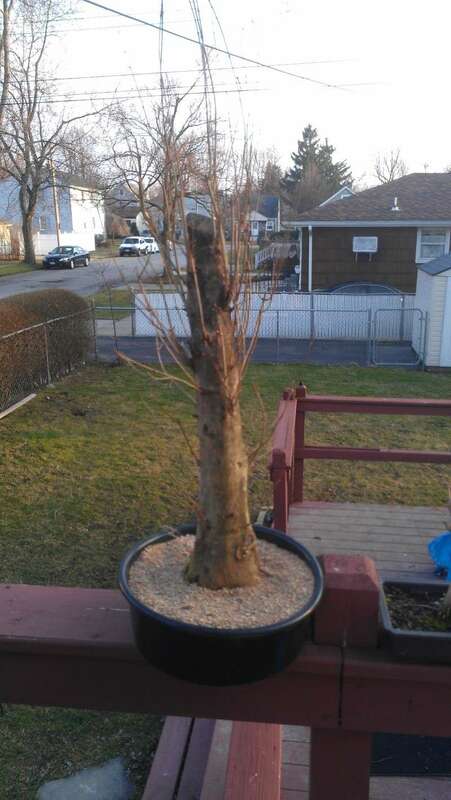 For the second tree I would wait until it hardens off in June/July to do the trunk chop. 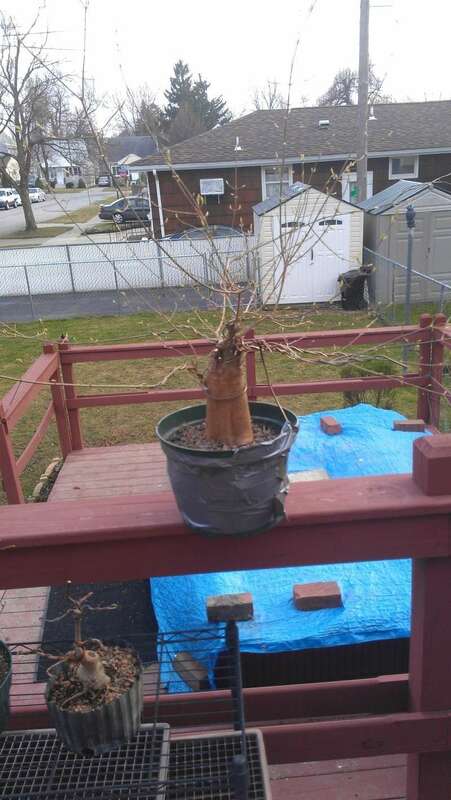 That will allow the roots to develop by having lots of branches and also results in less sap bleeding since the tree is not pushing sap as hard. The other time to do it is late fall/winter, but then you have an open would (even with would sealant) over the winter which is prone to infection, particularly psuedomonas in maples. I would suggest wiring the lower branches to more suitable angles so they set that way with the spring growth. You could also keep the top cut back a bit to encourage the lower branches to grow more (they are thin compared to the trunk). Looks better with a little basic styling. I will let the new leader grow.